Bold new direction or jumping the shark? This is the critical question sure to trail behind BULLET FOR MY VALENTINE, who is now, without a doubt, a far different beast than that which recorded "The Poison". For a band once claiming METALLICA, IRON MAIDEN and SLAYER as central influences (and having shared the stage with two of them), what BULLET FOR MY VALENTINE now engages comes drawn from pop angst in the realm of SEETHER, NONPOINT and BMFV's fellow countrymen, ASKING ALEXANDRIA. You could see this coming three years ago in spots on "Venom". 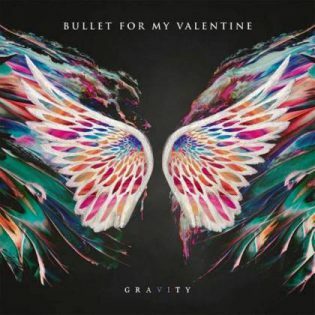 The mantra around the BULLET FOR MY VALENTINE camp in the past year has been "contemporary", which means electronics and synths get more face time, along with a decided emo kick on the band's fifth album, "Gravity". Shorn of more than half of the band's heaviness, "Gravity" is the sound of a new model, but it's a dicey speculation. Taking a chance isn't the album's biggest fault; its redundancy and stale mimicry of a surefire script is why the album not merely settles, it fails. The opening number, "Leap of Faith", gloms onto a pop-based form of agro rock you're no doubt well-versed in as far back as LINKIN PARK's "Hybrid Theory". A purring electro whir on the verses sets up lyrical penance based on "too many drugs and too many broken thoughts." "Over It" does thicken up the guitars, and Jamie Mathias's dipping bass lines offer an interesting diversion from what gets turned out as a commonplace metalcore angst jam with far less 'core. The "contemporary" scheme wears out as early as "Letting You Go" and it seldom deviates the remainder of the album despite a strong finish by the final two numbers, "Don't Need You" and "Breathe Underwater". If repetition is suitable to you, then by all means, kick out your jam, pluralizing inapplicable. Michael Paget's vocals, veered more toward a teen audience than when he was a teenager himself starting out in music, fits this newer mainstream mode, but it does come at a cost as the entire switch in sound does. The inexorableness of "Not Dead Yet" makes it a great big letdown, right down to the expectant whoa-oh chants and the replicated chord patterns of the track's predecessors. One of the tougher songs on the album being the DEFTONES-reminiscent "Piece of Me", Padget's shrill nattering borders on outright whining and his lyrical rant loses punch. The raging breakdown on "Piece of Me" is thus anticlimactic. Oh yeah, how about another round of "whoa-ohs" here for good measure? Not enough? How about another one for the title track? "Don't Need You" at least boasts some speed and it's the rowdiest number on the album, even if the pummeling paths lead to the same spot with the same droned choruses. The thing about carrying such a massive following as BULLET FOR MY VALENTINE does, the band will unavoidably lose some of its flock with this album while corralling a hefty portion of ASKING ALEXANDRIA's. Thus, the album’s sales projections should even out just fine. Whether that's emergence or just business, BULLET FOR MY VALENTINE has altered its course with great risk. Despite this album said to be Michael Paget's healing stone, "Gravity" unfortunately loses a ton of gravitas in the process.